The Herbert Hoover Presidential Library-Museum and the Herbert Hoover National Historic Site and Prairie are enjoyed by locals and visitors alike. At ACCIONA Windpower, we believe that we have something unique. That something is perspective. When we set out to engineer a wind turbine capable of maximum performance, it was easy to approach the design from our customers’ perspective because we were the customer. Our wind turbine technology is grounded in more than 15 years of operational observations made within our own wind farms in varied terrains and climates across the globe. Our turbine design answers the challenges facing project developers and owners today in the areas of performance, reliability, safety and cost-of-energy. We understand the needs of wind farm developers and owners because we’ve been there. The AW-1500 is designed for strength and reliability, ensuring that our customers achieve maximum availability from their investment. Our turbines have been deployed globally, representing 3,211 MW. Our 1.5 MW turbine is ideal for various wind conditions, with rotor diameters of 70, 77 or 82 meters and tower heights of 60 and 80 meters. The AW-1500 is GL certified for IEC wind classes Ia, IIa, IIb. The AW-3000 is the next product evolution from ACCIONA Windpower. This 3 MW machine is designed based on the same proven technology of the AW-1500 and will achieve greater energy production per wind turbine location. This turbine is designed for IEC classes Ia, IIa, IIIa. ACCIONA Windpower has been operating an AW-3000 prototype since October 2008 with extremely high availability. To further demonstrate the product’s performance, we will install additional 60 Hz AW-3000 machines in North America by 2011. We look forward to making the AW-3000 commercially available to the market in the near future. Our track record of quality and reliability speaks for itself: we have zero serial defects on critical components and we post a remarkably low global failure rate of less than 1% on major components. We provide project developers, long-term owners and lenders confidence in the assets that matter most. And with more than 3,200 MW installed, our global fleet availability is more than 98%. ACCIONA Windpower’s track record of quality is not only applied to our turbine technology, but our assembly plants as well – our three wind turbine assembly plants are ISO certified. Control software that allows intelligent automatic monitoring and operation. We take safety personally. We understand what it takes to maintain a wind farm, we care about the people behind the project and want to empower them to be more effective, efficient and most importantly, safe. Lifts – The two-person lift that comes standard in every ACCIONA Windpower turbine eliminates common industry issues like ergonomic injuries of the back, hips and knees. Hub access – Access to the hub form inside the nacelle eliminates the risk of a fall and the difficulties associated with hub access from outside the nacelle. Nacelle design – Our nacelle is designed to be spacious, allowing technicians ease-of-movement within, meaning they can get the job done more quickly and effectively, resulting in less down time for maintenance and repairs. We’ve also implemented protection from rotating parts. Transformers – For those project that require a step-up transformer, we install the equipment outside the nacelle, which reduces the risk of equipment damage if the uncommon, but potential incident of a transformer fire. We believe that our customers’ success is our success. Every client and every project is important to us and is treated with the same high level of attention. ACCIONA Windpower has made a significant investment in North America by establishing our manufacture headquarters in West Branch, Iowa. In doing so, we’ve built a centralized, domestic team of experts focused on serving our partners in the U.S. and Canada. Our versatility in services and support extends beyond manufacturing wind turbines to logistics management; wind turbine erection and commissioning; warranty and post-sales support; condition-based monitoring; and 24/7 remote operations. We are well-positioned to meet the growing demands for wind energy in North America. Our plant in Iowa has an annual production capacity of 450 units (675 MW) – and including our two plants in Spain our total global annual production capacity is 2,025 MW. ACCIONA Windpower is proud to be part of the community in West Branch, Iowa. The manufacturing sector is one that has continually prospered in the Midwest U.S., and ACCIONA plans to carry on that tradition. 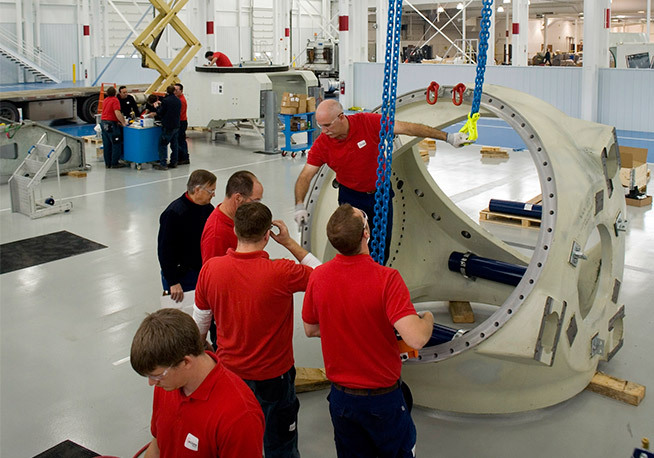 The availability of a skilled workforce and access to wind-industry education and training programs has enabled ACCIONA to build a talented pool of employees at our plant, more than 150-employees strong. A favorable business climate and state support for the wind industry drove ACCIONA’s site selection to Iowa. The region also has optimal proximity to the wind resources, with ideal access to inbound and outbound logistics for transportation options. ACCIONA Windpower’s West Branch manufacturing plant was constructed with sustainability at the forefront of our plans. By using a pre-engineered building with poured concrete floors, we were able to retrofit an abandoned plant to meet our unique specifications. We reclaimed 98 percent of the material from the old plant, minimizing waste and unnecessary consumption of new material. Taking it one step further, the roof of our plant is dotted with skylights that fill the factory floor with ambient light, reducing electricity use and improving working conditions.